Last week 173 galleries from all continents had gathered for Paris Photo inside the great halls of the Grand Palais. After Friday’s devastating attacks Paris Photo fair did not open for public anymore, as the city shut down in mourning. Openings elsewhere in Paris coincided with the fair and artists were present. Many of those shows will continue. The Grand Palais retrospective on French photographer Lucien Clergue, who was also the founder of the Arles photo festival, will be open until February next year. On Thursday I spent the day exploring Paris Photo booths and saw vintage prints of magical mid-19th century landscapes as well as famous 60s and 70s fashion photographs. And then the most recent abstract, camera-less explorations, where the ephemeral subject is just light. Spanning 150 years, the fair is a fascinating overview of the human gaze and the framing of the world: buildings, nature, fashions, people. At James Hyman Gallery from London I found the first ever pictures from the now lost ruins of Palmyra, taken in 1864 by Louis Vignes, a fairly unknown photographer. Priced at €4000, they seemed inexpensive for something so rare. More pricy black-and-white photos by big 20th century names were exhibited at Galerie Kicken from Berlin, including Lucien Clergue’s architectural images, such as abstract view of Grand Palais fountain from 1963. Today fine art photographers create prints on ever larger scale, echoing the narrative style of history painting. Many photographers, like the young French duo Yves Marchand & Romain Meffre, shoot on film and use large format cameras capturing detail with incredible sharpness. Their latest series of abandoned buildings were shown by Galerie Polka. Fascination with Le Corbusier buildings continues, as in German photographer Thomas Florschuetz’s 2013 study from Chandigarh, showcased at Galerie M Bochum. This year the Paris Photo talks were led by Oxford academic and critic Donatien Grau. 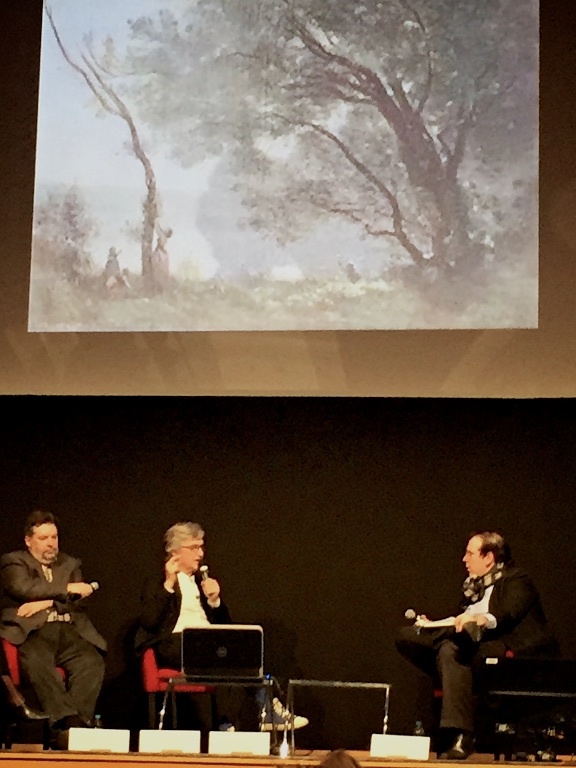 One of the highlights was a conversation on the relationship between painting and photography with filmmaker Wim Wenders, LA- based professor Russell Ferguson and Louvre curator Dominique de Font-Réault. A dense topic as there are links on so many levels. Ferguson used Jeff Wall’s work as an example of the complex processes behind fine art photography.